The United Nations has insisted its investigation into alleged war crimes in Sri Lanka will go ahead despite being told it will be denied visas. Earlier, President Mahinda Rajapaksa said the UN team would be refused entry because only Sri Lankan authorities could investigate the allegations. The UN decided earlier this year to investigate alleged crimes committed by government forces and Tamil rebels. Sri Lanka has refused to co-operate with the Human Rights Council inquiry. But UN Human Rights chief Navi Pillay said her team would be able to use technology, like internet phone service Skype and satellite imagery, to carry out its investigation. She referenced "highly credible" reports on abuses in Syria produced by her team despite not being allowed on the ground and said they would be able to do the same in Sri Lanka. 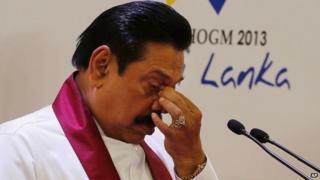 Mr Rajapaksa has insisted that only Sri Lankan authorities could investigate the war crimes allegations. "No one will take the UN inquiry seriously other than the people who want it," Mr Rajapaksa told journalists on Tuesday, reports BBC Sinhala's Azzam Ameen. But the UN believes Sri Lanka's own investigations have been slow and ineffective, says the BBC's Imogen Foulkes in Geneva. There are also real concerns that victims of violations may fear giving evidence to a government run inquiry, she adds. One UN report published three years ago said around 40,000 Tamil civilians died in the final weeks of the conflict, largely as a result of government shelling. Sri Lanka's army defeated separatist Tamil Tiger rebels after 26 years of bloody civil war in May 2009. Both sides have been accused of committing war crimes. The government has repeatedly denied that it committed war crimes and asserts that the inquiry is prejudiced.